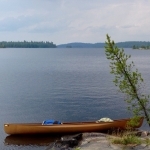 Canadian Canoe Routes • View topic - Can 1 boat do both tripping and WW play? Post subject: Re: Can 1 boat do both tripping and WW play? Eric Nyre is the most experienced dealer and paddler I know of with the Rendezvous, and if one were to insist on having one, a drive to Colorado to see Eric would be worth it. THAT is the value of having a relationship with a paddling dealer. Experience and knowledge. It is for sure not about price at all. If that is the bottom line, you may be shortchanging yourself. Experience is well worth money. I have learned the value of backpaddling in wave trains with the Argosy.. and can backpaddle well enough to get rear ended by paddlers who want to power through the stacks..and who lack the control for avoidance moves.. tailgaters eesh. No boat does it all well. However a lot of boats can be made to do a lot of things. As Kim attests, it often requires a different style. Many builders are building boats that are more specialized. A friend's Mohawk Rodeo is fun to to play with, but doesn't compare to my Outrage X for tripping ability on ww. My Clipper 14 Prospector(nothing like a Chestnut 14) was OK on flat water and was pretty handy in easy ww to 3. It was not a playboat, though it would surf. I recently got me a 20 year old MadRiver M.E. of and ps if a Mad river ME was available when I was looking, I would have had a serious decision to make, I paddled one when they first came out and liked it alot. On Oregon's Rogue last year, we took five days and there was a Whitesell Pyranha, a couple of Mohawk Probes(big and the smaller 12 II, and a Dagger Prophet. They all did well. Obviously on the slower sections they were SLOW. I rented a swift raven and although not a play boat I found it painfully slow on flatwater. Are(is) there a playboat that is comparable or more efficient on the flats than the raven? Yeah I know... I have to pick a water type but my shearwater has spoiled me and I have an itch for a river boat. Bear, I can't speak for the Raven, as I have not paddled one. However, regarding a boat for both play and tripping, you will of course find many who say it is impossible. Besides hull shape, how it is loaded, as well as how it is paddled make big differences. Of course, a longer boat will have a higher hull speed. As well, fine ends will be faster in the flats and wetter in the drops. My Outrage X is a great ww tripping boat, but is slow on the flats. But, with a decent angle of heel on the chine, it is fairly fast. Boats I would look at would be the Clipper Prospector 14 and the NC Super Nova. Glad to see someone else gave the old Mad River M.E. some love. Good boat for play or tripping. Had a buddy who took one down the Grand Canyon. Tracks great - far better than most play boats. And it's damn fast. I like it for a long summer weekend trip when there will be lots of booze and ww, and not a lot of sitting around. My friends who are not used to it find it very tippy, and I think there is certainly a getting-to-know-you period. On a longer trip, I like to live comfortably, so prefer a bigger boat for a long haul. A ESQ Canyon or NovaCraft Moisie is more my style. And, you can still paddle these solo and empty in CIII/IV water and have a ball on pretty tight stuff if you know what you're doing. Mohawk XL line was also good for both depending on your size, and how much you are willing to live without on a longer trip. Its got alot of inertia and sloth on the flats.. But it does what it was designed for very well. No better boat for downriver travel with current IMO. Playboat.. not.. microeddies were attainable by others in little Esquifs... I needed things called Truck Stop Eddy. It did its job well and with float bags and gear there was more than enough room to hire a D.J. and invite a dance partner. Stability was never an issue.